Americans Love Trail Mix. Can Kar’s New Packaging Make Them Buy More of It? Kar's packaging hadn't been refreshed for 30 years. A blend of nuts, dried fruit and (usually) pieces of chocolate, trail mix is considered by many to be the perfect energy food. It’s portable, tasty and rich in fiber and vitamins. And trail mix’s variants are as many as the hikers (and couch potatoes) who eat it. You’d think all of these factors would be great news for Kar’s, the 86-year-old Michigan company that makes Sweet ‘n Salty—currently the best-selling brand of trail mix in the country. And it is all good news, of course. But while trail mix might be simple, it turns out selling the stuff is not. 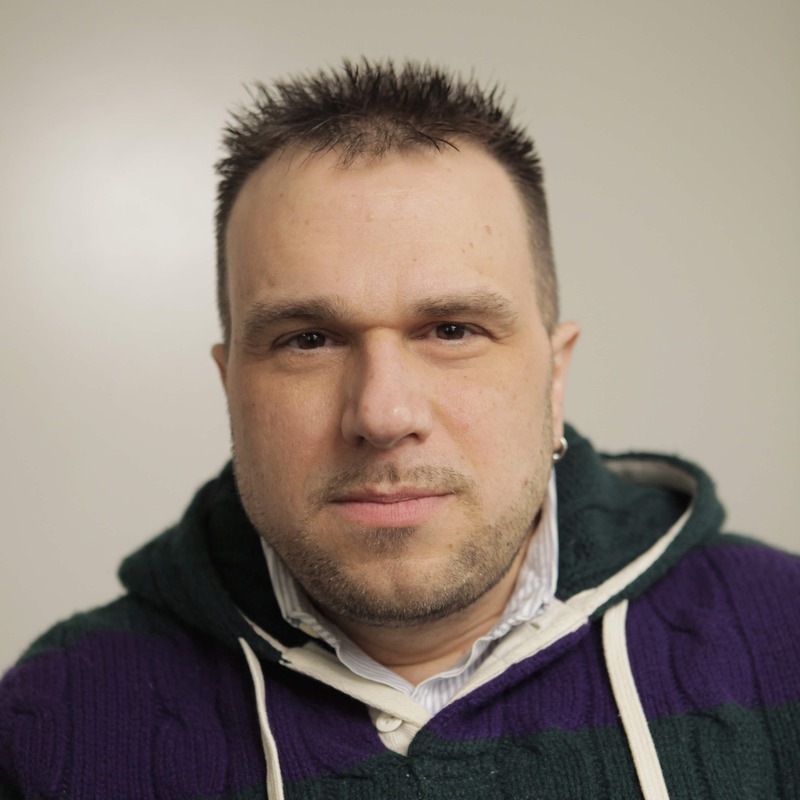 “You have to do it [with] quality, packaging and shelf image—you have to win at the point of sale,” he said. 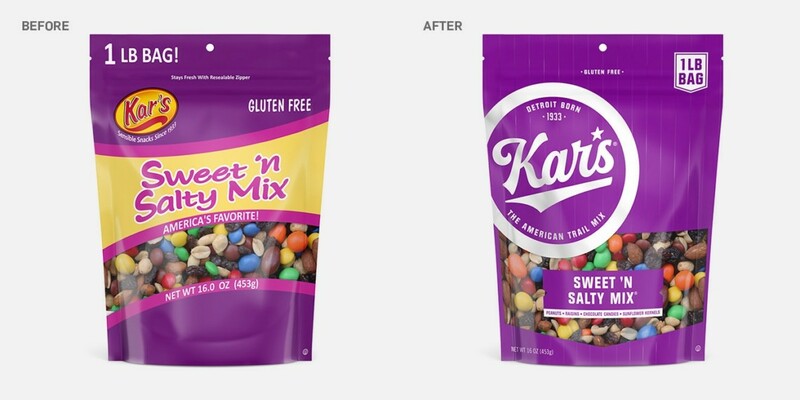 This is why loyal fans of Kar’s noticed a change recently when, for the first time in three decades, Kar’s sent its packaging in for a makeover. But the rebranding Lemley’s team did was also an exercise in strategic restraint. Bryan noted that however dated the packaging might have been, loyal Kar’s shoppers did recognize it—“so there was a significant risk to making huge changes,” he said. Hence, the core components, like the purple bag with its clear window, had to stay. What’s notably new is the logo treatment, which Retail Voodoo retooled to resemble the type on a baseball uniform—a nod to Kar’s having gotten its start outside Detroit’s Tiger Stadium. There’s also a blurb about the ballpark on the back of the package and a “Detroit Born 1933” slug just above the brand name. Kar’s got its start in the Motor City in 1933, when Sue Kar began roasting peanuts in her kitchen and selling them outside the ballpark, which was just across the street. Before long, Kar began distributing the nuts in local pubs and stores, and eventually the company opened its own roasting plant. After purchasing the brand in 1967, the Nicolay family expanded Kar’s offerings. Sweet ‘n Salty Mix appeared in 1997, and 2010 marked the debut of an upmarket sister brand called Second Nature, skewed largely toward women in search of non-GMO, “clean” ingredients. 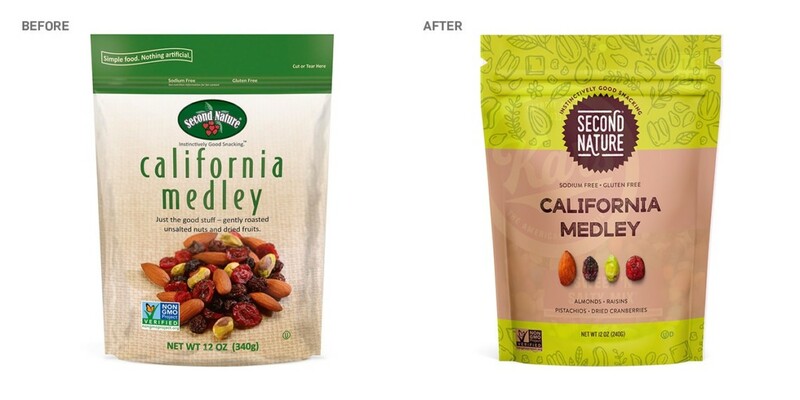 In addition to typography changes, Second Nature’s new packaging stresses the individuality of each ingredient—almonds, pistachios, dried cranberries, raisins—by picturing each one individually. Lemley’s team also gave more prominent billing to Second Nature’s tagline, “Instinctively Good Snacking,” and developed a systemized packaging architecture for both brands that helps shoppers identify the variety they want by color. Those colors turn out to be necessary, since both Kar’s and Second Nature now boast a wide variety of flavors designed to appeal to regional tastes—this geographic inclusiveness was the intent of the “American Trail Mix” slogan. 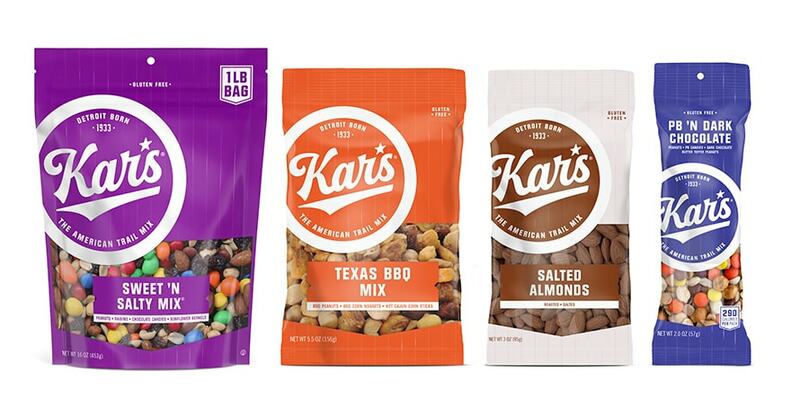 Though Sweet ‘n Salty might be pure Detroit, Kar’s now offers assortments aimed at regional preferences, including Texas BBQ and Key West Key Lime. Which raises the question of whether these new mixes are potentially too fancy to even be considered trail mix in the first place. After all, Jack Kerouac’s 1958 novel The Dharma Bums contains a scene in which Japhy Rider is making his own trail mix—“energy food,” he calls it—but all it is is a bag of peanuts, raisins and dried apricots. In the late 1960s, California surfer dudes used to make their own trail mix, too, but there’s little chance it resembled the Seattle Coffee or Mississippi Mud Pie varieties Kar’s sells.